BEERSHEBA, Israel — Israel raised the stakes in its battle with Hamas Monday by indicting a Palestinian engineer for masterminding the group’s rocket program and training fighters. Dirar Abu Sisi vanished from a sleeper train in Ukraine in February and mysteriously resurfaced days later in an Israeli prison, recalling the dramatic covert operations Israeli was once famous for. His abduction comes during an escalation in tensions between Israel and Hamas that many fear may rekindle full-scale fighting. The case of Abu Sisi has been veiled in secrecy since his family came forward last month saying he was snatched by Israeli operatives in Ukraine. Israeli authorities placed a gag order on the case, until the release of Monday’s indictment, though it still refuses to say how the 42-year-old Gazan was caught. The indictment accused Abu Sisi of masterminding the Islamic militant group’s rocket program and charged him with hundreds of counts of attempted murder, conspiracy to commit murder and production of weapons. The indictment described alleged meetings and conversations he held with Hamas operatives as far back as 2002. “Abu Sisi’s ongoing and significant activities in Hamas’ service over the past decade, with an emphasis on strengthening and improving the capabilities of Qassam rockets, allowed Hamas to create a growing threat to the Israeli home front, resulting in the death and wounding of many Israeli civilians,” it said. Hamas has fired thousands of rockets into Israel over the years, steadily increasing the range of the weapons from just a few to almost two dozen miles. After the hearing, Ben-Natan accused Israel of torturing her client and forcing him to sign Hebrew documents he did not understand. “We are going to ask to dismiss this indictment because of the abusive process that has been done to this person and the illegality of his detention,” she said. Israel launched a broad offensive in Gaza just over two years ago to halt persistent rocket fire, inflicting heavy losses on Hamas. While an informal cease-fire has been generally observed since then, violence has resumed in recent weeks with a cycle of rocket fire and Israeli reprisals. The Israeli military says Hamas has fully recovered from the 2009 offensive and upgraded its capabilities with longer-range rockets as well as anti-tank and anti-aircraft missiles. Monday’s indictment indicated that Israel believes Abu Sisi played a role in this recovery. Abu Sisi’s family says he has no connections to Hamas and that he was in Ukraine, his wife’s homeland, applying for residency. The indictment said he had received training on rocket technology at a military engineering academy in the former Soviet republic. Abu Sisi joined Hamas in 2002 and then after Israel’s three-week offensive against Hamas, was given the job of establishing a military academy to train Hamas’ officer corps, the indictment said. Using his skills as an engineer, the document claimed, he also developed propulsion and stabilization systems for rockets, developing a homegrown rocket that could fly up to 15 miles (22 kilometers) in 2007. During a brief courtroom appearance, Abu Sisi, a senior engineer at Gaza’s sole power plant, professed his innocence and accused Israel of trumping up charges against him in a futile attempt to gather information about Gilad Schalit, an Israeli soldier captured by Gaza militants nearly five years ago. Ukrainian law enforcement agencies have said they were not involved in the arrest and that foreign security agents are prohibited from operating on the Ukrainian territory. The Ukrainian Foreign Ministry has said it would demand an explanation from Israel. His family denied he belonged to Hamas or was a militant. 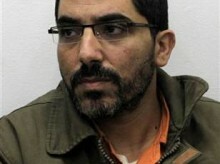 In Gaza, Hamas spokesman Sami Abu Zuhri denied the engineer is a member. “He is a Palestinian citizen kidnapped in a criminal gang-style operation while he was visiting his family in Ukraine, and all the Israeli accusations are only to justify his abduction,” he said. Robbie Sabel, a former legal adviser to Israel’s Foreign Ministry, said that under international law, it is irrelevant how Abu Sisi was brought to Israel. “Once somebody is in the country, he is within jurisdiction,” he said.